A great addition to your holiday décor, this personalized snowman stocking is all decked out and ready for your Christmas celebrations this year. 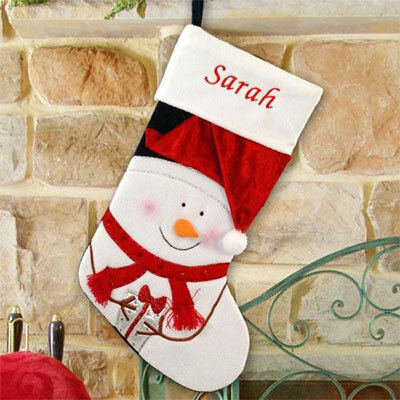 The personalized snowman stocking will look great on your mantle, wall or staircase this holiday season. Created from cotton and velvet, this Christmas stocking features a cheerful snowman complete with a festive red sequined scarf and red Santa hat. It measures 19 inches long and includes plenty of room for Santa to fill it with wonderful gifts. Customize your snowman stocking with the beautifully embroidered name of your choice (up to 12 characters) and enjoy FREE personalization. A personalized snowman stocking is a wonderful way to brighten your holiday home, and it will make a great Christmas gift for your loved ones as well. Order yours today for just $24.98 and beat the holiday rush.